If you lead a church or organization or business, or if you simply want a life that is lived on purpose, get Mission Drift. Savor it and learn from it. Only diligence keeps us on mission.Greer and Horst's book, which they provided for me to read and review, contains stories of organizations that have so departed from their original stated mission that they've changed their names to reflect their new identity. They interview leaders of Mission True organizations to plum their wisdom on what keeps their organization on track for the long haul. They share their own stories from Hope International on how tempting the small steps can be that ultimately pull you away from mission. You'll find key questions you, as a donor, can ask nonprofits to ensure the organization is staying Mission True before (and after) they get your money.To be Mission True takes vigilance. It's not always simple. Sometimes it means turning down the easy answer now to enable your future ministry. People may not understand. But Mission Drift—through targeted examples, a smattering of statistics and true wisdom—gives you reason to care and to make the hard choices to stay Mission True. A must read for anyone leading a mission-driven organization--not-for-profit or otherwise. It has strong warnings--with well known examples--regarding the great tendency for organizations to drift from their strong founding principles. But also some very practical areas of focus to help ensure that does not happen. This book was a great read. I highly recommend it to any church leaders or faith based organization leaders. Even if your church is on mission I believe this book does a great job helping you look beyond what you’ve already considered. In a world where are values are often questioned and scrutinized it is difficult to remain steadfast. Many small compromises, although they don’t change the message, lead to drift. I enjoyed reading this book and I believe it would be eye opening to many church boards and pastors. Solid. A bit redundant though in the writing. A very good read for anybody who works with a faith based charity. Good Read for Non Profit LeadersAs a founder of a non-profit (20 years ago) this book couldn’t have come into view at a better time. A good, quick read. The material was foundational and of utmost importance, yet it rarely moved past the rudimentary. That's okay, because the rudiments are what we often forget most quickly. Why do so many Christian organizations become secular within a generation or two? How does one build a focused ministry that doesn't change its core purpose? Peter Greer and Christ Horst provide some excellent answers in Mission Drift: The Unspoken Crisis Facing Leaders, Charities, and Churches. They have examined and analyzed various ministries, some that have stayed focused on their Gospel focused mission, and some that drifted away from that focus have become secular in focus, not spiritual.The authors make the interesting observation that "It is often Christians who seem most likely to be the biggest critics of bold Christian distinctiveness". They quote the Christian Founder of Quaker Oats speaking of people "who are much interested in the loaves and fishes, but not at all in the faith." They bring up organizations that were Christian at first, but now only help with material needs alone. Greer and Horst also make the case that meeting material needs is not the most important thing, rather, giving out the Gospel is the most important. Helping with people's physical needs does not save them for eternity, it only gives them comfort temporally. Helping with a person's spiritual need of the Gospel helps them have a right focus here on earth whether or not they are comfortable, and has them looking for the Kingdom that will never end. They warn that Mission Drift is inevitable unless it is actively fought against. "Never underestimate currents and winds - pay attention to them" is one of their warnings. Too many people think that they will be unaffected by physiological changes in society, moral trends and the like, and so don't consider them as threats. But sooner or later, the Christian ministry that is not anchored down with core principles, beliefs and practices will drift along with the stream of popular thought. Many organizations that were Christian at first became functionally secular/atheistic over time. They also address the fear that if a ministry/organization doesn't compromise its core beliefs at any point, it might collapse. The book has the excellent statement, "…how much better to collapse in allegiance than to survive by compromising what matters most?" I think that this is an excellent book and would recommend it to any Christian 'organization'.There are things that I do not agree with, but the only one I find worth mentioning is that the authors seem too ecumenical as they seem to consider Catholicism to be a correct presentation of the Gospel, and an accurate 'version' of Christianity. But I think that it is only implied, not explicitly stated.Many thanks to Bethany House Publishers for sending me a free review copy of this book(My review did not have to be favorable)! It's discouraging to hear when "Christian" organizations choose to water down their theology, place a heavier focus on cultural relevance, or give up their Christian values altogether for the sake of what is ultimately their bottom line. ChildFund (Christian Children's Fund), The Y (Young Men's Christian Association), and Harvard University are three prominent examples discussed in this book that started off with the explicit purpose of reaching others with the Gospel.While society will continue to pressure Christian organizations into a "conform or die" situation, and many organizations will eventually cave in, Greer shares that this "mission drift" doesn't have to be inevitable. Greer/Horst states that if organizations do the hard work of establishing and constantly promoting a strong, biblically-based immutable vision statement, bring on the right leaders, and make the hard decisions to protect and safeguard their mission, such organizations can not only weather the storms of changing culture, but even thrive.There's a lot of great insight into developing "mission true" organizations, but Greer/Horst try to limit the number of lists, bullet points, and do's/don'ts, instead sharing the successes, or failures of faith-based organizations. As every organization's values and subsequent challenges are unique, Greer/Horst intentionally structure the book in this way to make leaders think of how tailor the book's major points to their own organizations. On one hand, the case studies can lead to invaluable advice that can literally save an organization from disaster. On the other hand, this advice isn't always obvious and will require much thought.Perhaps this is beyond the scope of the book, but I came away still uncertain about where one can draw the line in regards to "mission drift". While the examples discussed in this book are obvious, the term "mission drift" has been thrown around lately in regards to the (over)emphasis of cultural issues within the church. To what extent should current social issues be discussed from the pulpit or through the church or organization's activities? A prominent pastor was recently criticized of "mission drift" by another pastor (both of whom I respect deeply) for discussing the Black Lives Matter movement from the pulpit. And yet a certain Christian organization who prominently promoted the movement during a recent national conference is praised repeatedly in this book for being "mission true". Perhaps such a line is hard to draw, and perhaps this book was written primarily for organizations headed completely off the edge. Mission Drifting-Who Knew?Mission Drift begins with the mission history of two infamous universities, Harvard (1636) and Yale (1701). Their original mission foundation was based on Christianity. They soon drifted from their primary mission of Christianity to secularization. This informational book is not afraid to name names of such Mission Drifters.In Chapter 4, there is discussion on the challenges Dr. Albert Mohler faced when he was elected president of Southern Baptist Theological Seminary. Before his appointment, the staff openly questioned the resurrection of Christ, his birth of the Virgin Mary, and did not believe in the Holy Trinity. And so it began, either you believe or you don’t. As a staffed employee, if you were a non-believer, you were dismissed. I believe Dr. Mohler’s actions were justified. How can one teach at a Christian Seminary and not believe in Jesus Christ? In addition to discussions in this chapter, there is a Mission Drift Survey to determine if your organization has fallen off the path in regards to their mission. The grid is sectioned into three parts: Mission True, Mission Drift, and Mission Untrue. It is a guide to help your organization redirect to its initial mission.Further information included is hiring of board members and staff, and the acceptance of donor contributions. The board and staff members beliefs should match that of the organization they are considering employment. It is communicated how many donors try to convince Christian organizations to tone down the Christianity upon which it is based, in exchange for contributions.This book has high-quality information for Christian organizations seeking to safeguard their original mission. It gives examples of faith-based organizations that drifted and never returned. I recommend this book to faith-based organizations and companies to be used as a reference guide. It could be distributed to board members and staffers as a gifting opportunity as well.I will end with my favorite quote from the book, Mr. David Wills, president of National Christians Foundation stated,“Crystal clear vision is the starting point for avoiding Mission Drift….If you don’t knowwhere you are going, any road will get youthere.”I received this book free from Bethany House Publishers for an unbiased and honest review. "Mission Drift: The Unspoken Crisis" should be on every church's to-read and review list. In fact, I would recommend it to any business of any size or mission (for-profit or non-profit). From the publishers introduction:"Is your organization in danger of Mission Drift? Without careful attention, faith-based organizations drift from their founding mission. It's that simple. It will happen.Slowly, silently, and with little fanfare, organizations routinely drift from their purpose, and many never return to their original intent. "And yes - this book is directed to Christian organizations (with a very short blurb about Catholic Institutions) that serve people. The authors skewer both major organizations that people associate with Christian beginnings (think of the "YMCA" or "Christian Children's Fund") and educational institutions (think Harvard or Yale). Even so - there are lessons to be learned by major corporations.There are many reasons that a Christian organization experiences "mission drift" and the authors enumerate them quite well - and even agree that on the surface many of these reasons appear reasonable and right - to enable the organization to continue it's good works. But as they explain during the analysis of organizations that have drifted and the reasons for that drift, these reasonable accommodations are not fully compared to the original mission. In some cases the mission statement as prepared by the organization is not what the reality of the organization is compared to.To give one example (a small spoiler) - what if a donor to the organization offers a large sum of money with the request to tone-down the "Jesus rhetoric" (or in non-profit terms - we can make a large sum of cash by ignoring our normal risk metrics). Is it in the best interest of the people that the Christian Organization serves to accept the donation, or to deny it? In terms of Mission Drift - "Run". If you want to stay true - you have to measure against the original mission and not be swayed each and every time.There are chapters about the assets of the organization and how to protect them (spiritual that is), how to find leaders for the organization, how to stay true to the mission and appendices to help organizations to "Stay True". The threat of “terrorist activities or violence of any kind” took a back seat to the threat of the Gospel. Our culture is growing in its suspicion of anything faith-based–enough to rank “exposure” to the Good News as more dangerous than terrorism. - Mission Drift, 51% through book, in reference to a foundation who invited the author to apply for funding.Mission Drift: The Unspoken Crisis Facing Leaders, Charities, and Churches by Peter Greer and Chris Horst is a book every Christian person and organization needs to read. We are all in danger of drifting from our mission whether through receiving funding from others who don’t share our beliefs, hiring people that don’t carry our vision, or on a more personal level, leaving our missional purpose slowly through every bad decision. Another drift mentioned were examples of leadership bending to the monster of political correctness when wealthy donors would ask a company to compromise just a little or allot on their Christian message.Examples of companies who fell under the scrutiny of non-believers and have wandered far from their original message were mentioned in this book as well as examples of companies that have stayed Christian-strong for generations. I found it encouraging to read this book. For businesses who wish to leave behind a legacy, Mission Drift should be mandatory reading. It gives instructions by example how not to drift. At the time I was reading about WorldVision, they were in the news for compromising on their strong Christian beliefs. Mission Drift spoke about how WorldVision never wandered from its principles. The current news compared to when Mission Drift wrote about WorldVision tells me how easy it is to drift, even for a moment, in the face of public pressure. A believer in Christ must stay strong in the face of ridicule. It’s so rare to hear about people or companies standing for something. Those are usually accused of being judgmental or cold, even non-Christian, by some of our own Christians.The stories of companies that, even today, stand for their Christian values urge me to stand firmer in mine. I gave this book four stars. Book given by publisher to review. Found it slightly repetitive (tendency of many American books?!) but otherwise helpful. Was very pleased with the genuine faith element that ran through the book. I was cynically expecting less rigour! Greer & Horst identify the great challenge of any leader - ensuring the organisation stays true to its mission, particularly applied to the setting of churches in the modern society.Writing from their own experiences and challenges in running a mission organisation, and the temptations to modify their mission for significant financial support.They supplement with stories from organisations that have changed their purpose and mission over time.They provide strategies to avoid mission drift, and to keep the organisation focussed on its true mission.Substantial time is spent on leadership and governance of organisations, particularly on the integrity of the individuals and groups involved in setting and running the strategic direction of the organisation.A particularly good book for senior leaders and those in governance to ensure that they recognise the signs leading to drifting from purpose and how to rectify issues. i'm only a quarter through this book and it is already one i know i'll be rereading and giving as a gift.really simple, obvious advice that is so easy to forget. read your mission statement. are you working towards and w/it? have you gone away from what your priorities were, why you founded the organization? are you where you were meant to be?great book for leaders in non-profit and faith based organizatons.full disclosure, i did win this book which is too bad, i would never have noticed it on the shelves or in a catalog. not my kind of book, doesn't apply to me, i'll never be a manager, but what a gift to give one. even to give to a pastor. and the lower level workers could be helped by reading it, being reminded of what the company/organization is focused on and toward. I would highly recommend this book to anyone who cares about mission. As a member of a board, this was incredibly insightful and it will, no doubt, stimulate great discussions. I suspect it will also bring some new proposals.As a preacher, I intend to modify the questions slightly to fit our situation. I believe our staff and elders need to look at this carefully. Right now--we are mission-focused. I don't want us to lose that, so I believe this can really help. **Reread the book recently. Reminded how significant this issue is. We used it as part of a non-profit board discussion which was really helpful in our clarifying our mission and some threats to our direction. It also led to some decisions about how to proceed into the future with some strengthened resolve and methods for protecting the organization. 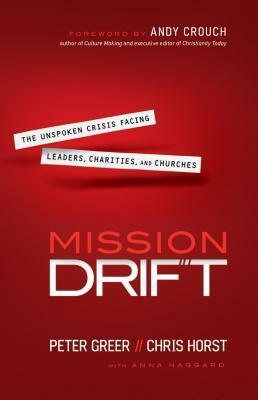 Mission Drift: The Unspoken Crisis Facing Leaders, Charities, and Churches this was a social read. I have a big belief in Charities but to often I find they have strayed from their mission statements. In fact a Pastor I once spoke with stated that some people "in need" have so many holes in their bucket it is really not beneficial to continue to help them. I have always been a big giver and have a hard time with this statement because to me anyone in need should get what they need. Peter and Chris, through personal transparency illustrate just how important it is to keeping mission on point. To help organize and provide examples to keep our actions in line with our words. Great read if you are into Charity or Church related fields. The central thesis of the book is that organizations should define their mission, and consider all goals in light of that mission. That's not really a hard concept to get one's head around, and that shows in the book - it's mostly short tips for making that happen, and case studies showing positives (organizations that did it well) and negatives (organizations that "drifted").Definitely worth reading for anybody who's leading a faith-based organization. An important book for any Christian organizationA very thoughtful book about what keeps a Christian ministry centered. Great case studies of organization's that have remained true to the Gospel and their original purpose vs. those that have drifted into secular approaches. I highly recommend for any board member or senior leader in the Christian non-profile world. Proud of my friend Chris Horst for writing his first book on the tremendous challenges facing mission-driven organizations to stay true to their founding principles. Chris and Peter have written a clarion call for churches, donors, and staffers to recommit themselves to stopping mission drift by embracing the values and visions of their organizational founders. A good rehearsal of the basic principles necessary to keep organizations from going the way of all flesh. The New St. Andrews board reads a book together in between each of our quarterly board meetings, and this was the one on tap. It contained some really good ideas. A great read if you serve on any boards at all. An amazing book which really caused me to wonder and question about the organization I am a part of. Are we mission loyal. I fear we are probably somewhere in between. Not loyal but not yet completely abandoning our mission either. A must read for anyone working in the ministry and in particular para-church ministries. A very good book. This book is a great reminder of any Christian organization's need to make its mission a priority. Filled with both good and bad examples, along with timeless principles, Mission Drift shows the reader the important factors that determine whether or not an organization stays "mission true," experiences drift, or becomes "mission untrue." I highly recommend this book to all Christian leaders. If you lead or help lead a business this book tackles a helpful idea. But if you lead or help lead a nonprofit, ministry, or church this is an essential idea to have a firm grasp of. Mission drift is very real & must be guarded against. Choosing between good & best is always tricky, but these precepts can help create a culture that is mission true. Very good insight on why it's important to stick to your original vision. A must-read for churches, non-profits or anyone who wants to continue to remain focused on Christ. I gave 4 stars because the book had a lot of good stories and principles but was repetitive. Why do some organizations stay true to their original mission and others morph into something their founders would abhor? This book is about building succession into your organization, a top priority for every church that wants to stay faithful.